The Atlas of Forensic Pathology, For Police, Forensic Scientists, Attorneys and Death Investigators is a Major Reference Work that is specifically is designed for non-pathologists who normally interact with forensic pathologists. Chapters 1 through 6 will provide background information regarding medicine, pathology, forensic pathology, death investigation, cause, manner and mechanism of death, death certification, and anatomy and physiology. The next 3 chapters will deal with general topics within forensic pathology, including the forensic autopsy, postmortem changes and time of death, and body identification. Chapters 10 through 20 will detail the major types of deaths encountered by forensic pathologists, including natural deaths, drug/toxin deaths, blunt force injuries, gunshot wounds, sharp force injuries, asphyxia, drowning, electrocution, temperature-related injuries, burns and fires, and infant/childhood deaths. The final chapter includes brief descriptions dealing with various miscellaneous topics, such as in-custody deaths, homicidal deaths related to underlying natural disease, and artifacts in forensic pathology. 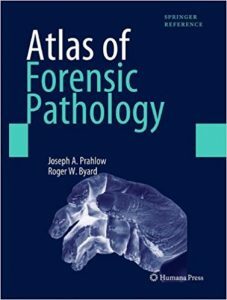 This atlas differs from competition in that no atlas currently exists that address material for non-pathologists (detectives, forensic entomologists and pathologists), who normally interact with forensic pathologists. The book will present such images that are or interest to not only forensic pathologists but also of interest to odontology, anthropology, crime scene investigators, fingerprints specialists, DNA specialists and entomologists, etc. The competing atlases present images of interest mostly to medical examiners, forensic pathologists and pathologists and consist mostly of wounds, and trauma with some coverage of diseases. The color photographs will come from the collection of over 50,000 slides in the Adelaide Australia collection and some 100,000 slides from the collection compiled by Dr. Prahlow that includes slides from Cook County, Indianapolis, and North Carolina.